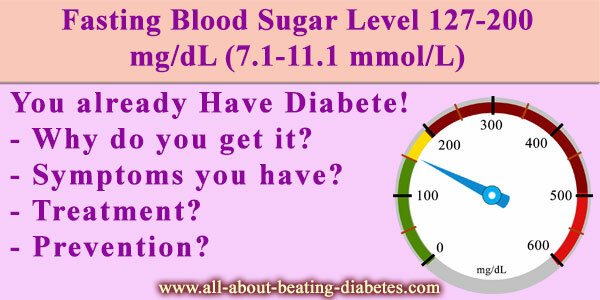 Fasting Blood Sugar Level 127-200 mgdl - Diabetes?! If having fasting blood sugar level 127-200 mg/dl means you definitely have diabetes. 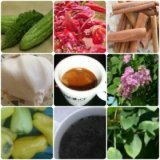 Why getting fasting blood sugar range from 127 to 200? Both type 1 and type 2 diabetes can cause fasting blood sugar level 127-200 mg/dl. If having type 1 diabetes, these levels of blood sugar are due to insufficient insulin production. Insulin is responsible for “opening the doors of the cells” to glucose. If it lacks, the glucose will not be able to enter the cells and, thus, it will build up in the bloodstream. In type 2 diabetes, the cells are irresponsible towards insulin, or insulin production is insufficient, or both. Some of the most common symptoms of both type 1 and type 2 diabetes are: polyuria (increased urine output), polydipsia (increased thirst), weight loss, fatigue, hunger, skin problems, slow healing wounds, yeast infection, blurred vision and tingling or numbness in feet or toes. Fasting blood sugar 127-200mg/dl means having diabetes. In this case, treatment is necessary to prevent further damages of the organism. The treatment of diabetes includes both, lifestyle changes and drug therapy, both equally important. 1-Lifestyle changes include eating a healthy diet. Choosing fiber-rich foods such as whole grain products, legumes, vegetables and fruits, and cutting out foods rich in calories and fat. Exercising is also important. Losing only 5-10% of your body weight would significantly decrease your blood sugar levels. Try riding a bicycle to work, playing a favorite sport, brisk walking, swimming laps etc. Exercise at least 30-60 min every day most at least 4 days of the week. Quit smoking and alcohol. Smoking and drinking alcohol not only make your sugar blood levels worse but also helps in developing diabetes complications. It would be best to quit them both. 2-Drug therapy is the most common treatment of diabetes. Type 1 diabetes’s only treatment is insulin. The treatment of type 2 diabetes includes oral drugs and insulin. The treatment should be done as your doctor schedules. Diabetes is a sneaky disease. It can cause no symptom until it has advanced much. In people with a positive familiar history of diabetes, measuring glucose levels every 6 months is advisable. For other people, the measurement of glucose should be done every year. If already having prediabetes, lifestyle changes are necessary to prevent it from developing type 2 diabetes. Sometimes, according to your condition, your doctor might prescribe you diabetes-lowering drugs.